As a youngster, living in France where he was born, Jacques vividly remembers the enjoyment of sketching birds, animals and flowers with coloured pencils. Even though many remarked on his talent, it was never nurtured and so faded this gift quietly as time passed on. He immigrated with his parents to South Africa in 1969. Two years of military service in the wild bush of South Africa and Namibia, often enduring harsh habitat and climatic conditions, must have inadvertently stimulated an interest in the outdoors, because it was soon after completing his service, that Jacques suddenly acquired a fresh appreciation for nature. He became absorbed and not surprisingly captivated by all of nature’s magnificent and rich treasures. This in turn reinspired his old and previously unexplored passion for art, but that was still to take a back seat. A ten-year career span in design, specializing in detailed work led him to using his favorite medium of former years – pencils. 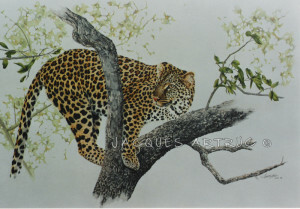 In all of this time his consuming passion for wildlife remained evident and so did his vision of becoming a wildlife artist. His first attempts at drawing showed little of years gone by. Undaunted, he pushed ahead relentlessly. An impassioned dedication and patience has permitted him to attain gratification from working with coloured pencils. Improving and perfecting his technique, constantly developing, changing, experimenting and refining this preferred art medium, has been Jacques’ primary ojective. Jacques has applied his many years of experience in designing to develop his style, as is apparent in the highly detailed finishes of his artworks. He always strives to respectfully portray the splendour of the natural world with accuracy. He urges those who value his work to judge for themselves.